Flies are a major nuisance in homes. They are known for possessing and carrying many different forms of disease – over 100. Family Pest Solutions offers a full pest control solution to this problem. We take a three-step process when it comes to exterminating flies in Albany, beginning with a detailed inspection, followed up by reports, and then finally our recommendations. 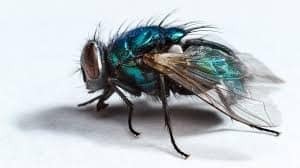 There are many different types of flies, and as such, our fly extermination service will be customized depending on the type of fly infesting your home. If you have a fly problem, please call Family Pest Solutions immediately so that we can begin helping you! Female house flies are able to lay 150 eggs at one time. Females will lay five to six of these batches of eggs in a few days. A day after house fly eggs have been laid, they begin to hatch in the form of maggots. Maggots feed for up to five days, molting during the process. Once they complete this cycle, they began finding dark places to pupate. The pupae are covered in a hard shell where they safely develop into a full-grown fly – this takes up to six days. After they break from their cocoons, it only takes as little as two days for them to be able to reproduce. House flies have a life span of 15 days up to one month. DO I HAVE A FLY INFESTATION IN MY ALBANY, NY HOME? You’re seeing a lot of flies – you may see flies frequently flying around in your home near food or trash cans. Dark spots in a cluster – you may be able to find some dark clusters of spots in lights and higher areas of your home. You’ve seen maggots – maggots are most commonly found in trash cans or around rotting foods. HOW CAN I PREVENT FLIES FROM INFESTING MY HOME? Flies are a straightforward pest, and prevention can be simple with some discipline. Family Pest Solutions recommends making sure your home is clean and sanitized. Don’t leave out any foods that can go bad and wrap up organic material before disposing of it within your home. Also ensure that your waste containers are sealed as tightly as they can be. That way no flies can make their way in to lay eggs, and no maggots or flies can find their way out if they have already begun an infestation. HOW CAN FAMILY PEST SOLUTIONS HELP ME GET RID OF FLIES? Family Pest Solutions is proud to offer pest control services to the greater Capital District, offering fly control services to Albany, Troy, Schenectady, and Clifton Park, NY. We can help by performing our three-step pest control prep – we offer a detailed inspection, followed by reports on the inspection, as well as recommendations on which of our services best suit you moving forward. Call us now, or use the form on our website to get started on a free estimate or inspection process.